Wollundry Rotary's funding support for defibrillators has now closed for round 1. Defib For Life Wagga is a joint initiative of Defib For Life and the Rotary Club of Wollundry, Wagga Wagga aiming to raise general public awareness of Sudden Cardiac Arrest and the importance of defibrillators, how simple and easy they are to use, and increase the number of defibrillators in the Wagga Wagga community. Rotary member Travis Downie felt compelled to act after he was personally affected by Sudden Cardiac Arrest, and witnessed first-hand the saving of a life only because a defibrillator was accessible. "Many people are frightened to use a defibrillator in an emergency situation, as they think they cause further harm to the victim. We need to change this perception - you cannot harm anyone by using a defibrillator, you can only help save their life." - Travis Downie, Rotary Club of Wollundry, Wagga. A Sudden Cardiac Arrest can happen to anyone at any time, and the chances of survival decrease by 10% every minute after the arrest. An Automatic External Defibrillator (AED) is vital in treating a Sudden Cardiac Arrest, they are simple and easy to use, and no harm can be done by using one. Does your club, community group, work or business have an AED? Don't think Sudden Cardiac Arrest won't affect you or a loved one, 1 in every 500 people has an undiagnosed heart condition which significantly increases the chance of Sudden Cardiac Arrest. Sudden cardiac arrest (SCA) is a condition in which the heart suddenly and unexpectedly stops beating; the heart's electrical system malfunctions causing rhythms that is rapid (ventricular tachycardia) or chaotic (ventricular fibrillation) or both. The heart muscle quivers or fibrillates rather than pump blood. Vital organs are immediately deprived of oxygen, causing the victim to collapse. SCA usually causes death if it's not treated within minutes. An Automated External Defibrillator (AED) is an external device that delivers an electrical shock to the heart when an arrhythmia is present to restore the heart to a regular rhythm after it has suffered a sudden cardiac arrest. In fact, a defibrillator shock is the only definitive treatment of Sudden Cardiac Arrest (SCA). Anyone can operate an AED, as it is the machine that makes the decision whether to shock or not, not the operator. It is a common misconception that comprehensive training is necessary to operate an AED. The machinery itself walks the user through the process step-by-step to guide the user in the event of an emergency. Defib For Life recommends that due to the seriousness of the circumstances in which a device is to be used, that a short training session is provided with every AED that is purchased to ensure many people within the sporting club or business have a base knowledge of what to do in the case of an emergency. It is important to understand that fully automatic AED’s will not shock if they detect electrical impulses, e.g., a regular heart rate, so there is no chance of harming the victim. Before operating the AED, Stay calm and call 000. When the AED kit is opened, the machine will commence talking the user through the process, beginning by asking the user to place the sticky pads onto the chest of the person in cardiac arrest. From here, the electrodes send information about the heart rhythm to the AED, to analyse whether an electric shock is required, or whether CPR should be continued. 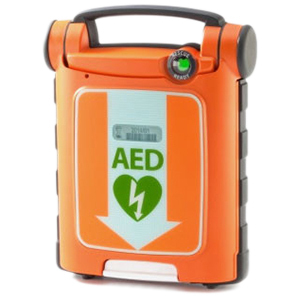 If a shock is required, the AED will advise, and ask all present to prepare for the machine to deliver a shock. This will not occur if a regular heart rhythm is detected, which is why no harm can be done by attaching the AED in an emergency situation. Why are AEDs so vital? AED's are so vital as it is the only thing that will arrest a Sudden Cardiac Arrest! When a Sudden Cardiac Arrest occurs, the heart stops; and an AED is the only piece of equipment that will restart the heart. AEDs are an extremely vital piece of technology within the community, as SCA is the leading cause of death in Australia. More than 30,000 Australians suffer an out of hospital SCA every year. Every minute that passes following a sudden cardiac arrest, the chances of survival reduce by 10%, and the first five minutes after occurrence are the most crucial. On average in Australia, ambulances take 9-15 minutes to arrive, which is why having an AED ready and accessible in all public areas is vital. How can I apply for the Rotary grant to purchase an AED for my organisation, group or club? Business, community groups, sporting groups and schools can apply for the Defib For Life Wagga grant by accessing the application form. "Even if you aren't a paramedic, you don't have any training or you've never used an AED before - you cannot do any harm, and you are capable of saving someone's life!" 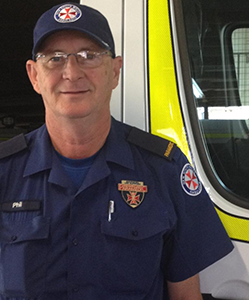 Defib For Life Wagga ambassador and local paramedic of more than 40 years.